Auditions call for The Wiz. Forth Children’s Theatre is very excited to announce their next production will be The Wiz at Easter 2016. This fun and funky musical puts a modern spin on the classic tale of The Wizard of Oz, with all the original characters. Watch Dorothy dance and sing her way from Kansas to Oz with help from the Scarecrow, Tinman and, of course, the cowardly Lion. This story will send you on an adventure exploring the themes of friendship, determination and believing in yourself. The show features a wide variety of imaginable characters from the Munchkins to the Wicked Witch; this paired with an impressive score will make it a very fun and lively musical for a Forth Children’s Theatre. This is a very upbeat musical which requires boys and girls aged between 10 and 18 with lots of passion and talent for singing, acting and dancing. The show needs a strong chorus to carry the powerful score as well as individuals to portray a wide range of big principal roles. So if you want to be part of this incredible show please come along to the auditions on Sunday the 13th of December. The auditions will be between 10.00am ­6.00pm. Please come along ready to start at 10am. People can leave once they are free but please be prepared to stay until 6pm if required. 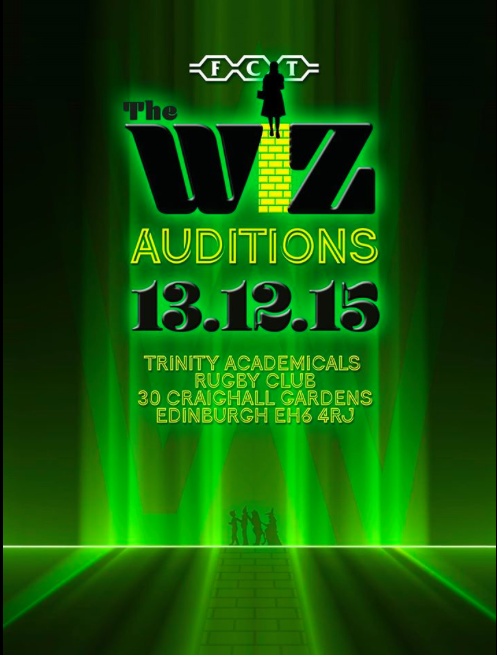 Auditions will take place at the Trinity Academicals Rugby Club in Craighall Gardens. Your audition day will consist of a combination of hard work and lots of fun. You do not need to have any material prepared as we will spend the morning taking part in various workshops where you will learn some material from the show. In the afternoon we will ask groups to come and audition the pieces learnt that morning in front of a small number of people from the Directing team.For casting purposes, filming of auditions may take place on the day. I would be grateful for people to let me know in advance if there are any issues with this. Rehearsals will start on Friday 8th January and will take place on Friday nights and Sunday afternoons thereafter. Principals will also be required from time to time for additional rehearsals which would take place on a weeknight. The show will run from Wednesday the 6th of April until Saturday the 9th, please note that there will be a matinee performance on the Saturday. You must be aged 10 by the start of show week. For more information, please email pdowens91@hotmail.co.uk or call 07518449375. Our 2007 Festival Fringe production.